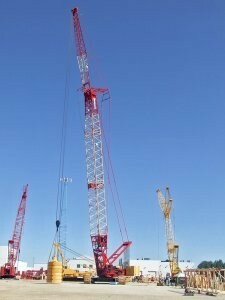 Manitowoc Cranes released a fixed jib option for its popular 400 t (440 USt) crawler crane, the Manitowoc 16000. This new option, designed at the request of many customers, complements the existing luffing jib attachment. The fixed jib for the Manitowoc 16000 has a 93 t (102 USt) capacity and a maximum length of 42.7 m (140 ft). At a length of 24.4 m (80 ft), the fixed jib can be installed on a 72 m (236.2 ft) main boom. This newly designed jib helps reduce rigging time for applications where luffing is not required or at sites that do not facilitate the use of a luffing jib. A fixed jib for this capacity is typically used in offshore oil platform fabrication yards, on transportation and infrastructure projects, as well as in refineries and petrochemical facilities. Jerry Maloney, global product director for crawler cranes at Manitowoc, said that this fixed jib is useful in any situations in which the crane operator must lift up and over existing structures. Continuing Manitowoc’s efforts to provide as much asset utilization as possible to its customers, the 16000 fixed jib incorporates inserts and other components from the Manitowoc Model 2250 luffing jib.